The sofa search is over! 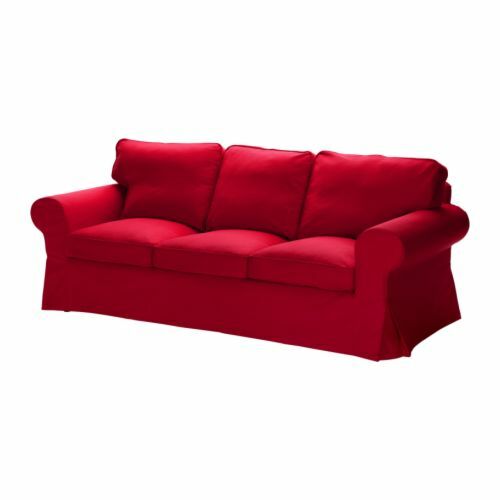 For the last 8 years (up until our yard sale in November) we sat every day on a bright red Ektorp sofa from IKEA. We rented a giant moving truck and drove it up to the College Park, Maryland IKEA to buy it (before there was an IKEA anywhere closer). We bought the matching chair and ottoman as well. It all served us very well for a long time. But the pugs took their toll on the back cushions. Pugs are a wee bit catlike. They (at least ours) like to sit up on the back of the sofa or chair. This smushed down the back cushions and eventually they didn’t bounce back. Zoe and her razor sharp puppy teeth took her toll on the slipcover. We loved that we could remove the slip covers from each cushion to wash them. We also loved that it was affordable. As our move drew closer we realized that the Ektorp was not going to be taking up space on the moving truck. The search for a new sofa was on! We knew we wanted no loose cushions on the back so the pugs wouldn’t have any to ruin. CSP decided he wanted a chaise instead of a chair and ottoman. I wanted sofas on legs with space underneath. That helps your room look bigger and I was tired of moving the sofa or chair and finding all the pugs’ toys and chewies shoved under there. We also wanted wide arms. Unfortunately I couldn’t find anything like that at IKEA or any of the local stores. 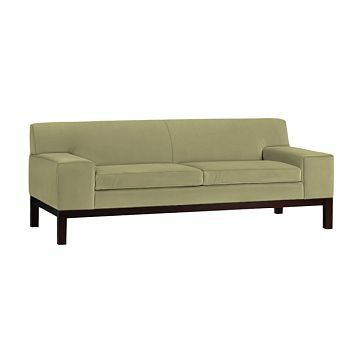 One day I was flipping through the West Elm catalog and saw the perfect sofa. The heavens parted and angels sang! No loose cushions! Wide arms! Up on stylish legs! In our budget! Fun colors to choose from! No removable slipcovers but the fabric is treated to repel stains. Loved the styling! I showed CSP and sighed, dreaming of finding a sofa like that in a local shop. In the meantime we’d just sit on our hand me down bonus room sofa since we were losing the bonus room anyway. Then I closed the catalog and could not believe my eyes! Charlotte has a West Elm store! I thought the closest one was in Atlanta! Woot! We moved, got settled and went to the West Elm store to see my beloved Lorimer sofa in person. I had a moment of panic on the way: what if it isn’t comfy? What if the arms are too low? But no, it’s fabulous! It was even more comfy than I had hoped! 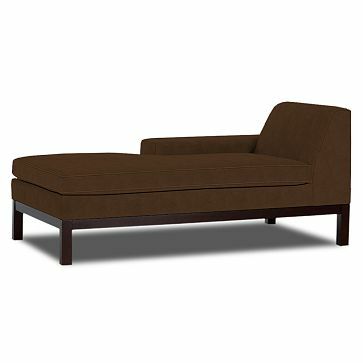 CSP picked out his chaise in espresso, a dark brown. I picked lichen for my sofa. SO pretty! They’ll be here in 8-10 weeks. Well, from the time we ordered them a few weeks ago. And when we moved we received a coupon in the mail from West Elm so we saved a bunch of money! Plus when you use their store credit card you earn Design Dollars (10% of your purchase price) to use as a gift card of sorts in the store. Woot! They won’t charge us until they ship so I can’t go spend my design dollars yet, but I’m sure making a wish list. I’m currently obsessed with throw pillows to go with the new colors. Pale green and dark brown are a big departure from red! I can’t wait for the sofas to arrive! They’ll get here just in time for the Mustachio baby shower I’m throwing in March!